No birthday party or wedding these days seem complete without a beautifully adorned cake. And this comes at no surprise. In recent years, cake stores here in Singapore have been smashing expectations with their lavish designs and carefully produced cakes that promise to leave all your guests wowed. And if price is a huge concern, fret not! We’ve done our research for you. Presenting Discover SG’s list of custom ‘cakeries’ (cake + bakery = an interesting new word learnt!) that promises to be both pocket friendly (within careful means, of course!) and visually entrancing. You’ll be so much in awe by the end of this post that we bet you either want to give baking a go, or you’re running to the store to make a purchase. Mad About Sucre bakes some of the most gorgeous cakes here in Singapore, period. This cakery marries some of the best French confection techniques with the most glorious British designs. Think clean, white-tiered cakes with an intense focus on the sublime details and features that inevitably stand out. With cakes baked by co-owner and Le Corden Blue graduate Lena Chan, quality is something that you can certainly be assured of. As a promise to their customers, the cakery does not use pre-mixes and artificial flavorings, and instead only uses healthy ingredients like organic flour and raw unbleached sugar. If you’re not too interested in full sized cakes, you could head down to their brick and mortar store to try some of their fresh baked pastries and delicacies as well. Some passions blossom out of curiosity, as did Feby’s (pronounced Phoebe) love for baking. Astoundingly, the owner and head baker of Febspantry learnt everything about the trade without any professional help or expertise. It all started with a heap of curiosity and tons of trial and error. Feby’s immense talent has allowed her to produce some of the most gorgeous floral cake designs. She has a keen eye for colors, as she beautifully pairs the different floral designs and patterns against a white buttercream cake base. Each single tier cake painstakingly takes about 4-6 hours to decorate, which sure makes the cake cutting session a whole lot tougher now. Aside from her custom-made cakes, Feby also bakes gorgeously designed cupcakes and occasionally, cookies. With cakes featured on herworld brides and style: weddings, Susucre is definitely a name that brides-to-be will chance upon. Their cakes are made from scratch with only the highest quality ingredients, and customised designs that promise to perfectly suit your wedding aesthetics. Susucre also creates some of the cutest design cakes out there – allowing your favourite characters a feature at your birthday celebration. All that difference makes your celebration all the more personalised. From princesses like Anna and Else from Frozen, to designer bags from Dior and Chanel to even your favorite football club, Suscure can do it all! If you’re up for the challenge, you could even head to their studio to join a cake-decorating lesson. To date, they have hosted classes on designing a handbag cake and a princess cake! Ngee Ann Polytechnic based café and bakery, Cupplets, was opened in 2013 by couple, Ernest and Samantha. Aside from the pastries that they sell in store, Cupplets is also very well known for its custom made buttercream cakes. The cakes are available in a number of designs, though Cupplets is more notably popular for its floral designed cakes. These cakes are adorned with very beautifully paired flowers and fruits that are an absolute delight to look at. If you’re also looking for a dessert table at your celebration, do consider this store as they promise to amaze with their beautifully designed cakes and delicious pastries! The frosted chick specialises in making customised cakes, cupcakes and dessert tables that promise to taste as good as they look. Their ability to make your favourite cartoon characters come to life through their cake designs is astonishing, allowing just a little more personalisation to any event. Another option would be to have The Frosted Chick set up your whole dessert table entirely! They will certainly not disappoint by ensuring that the desserts perfectly match the theme of your event. Just check out their adorable tsum tsum cupcakes or minion themed macaroons! Need we say more? If simplicity is what you’re after, you’ll definitely love the works of Crummb Cakes. They offer some of the most beautiful and elegant cakes out there. Their cakes may look extremely simple, but be assured that simplicity is sometimes the hardest thing to recreate. Their moist and tender butter cakes are paired with Italian meringue buttercream, and are both available in an assortment of flavours. Even though Crummb Cakes may be a little on the pricier end, do know that a basic 3-tier cake is able to feed a party of 140! Price Range: Starts from $650 for a 3-tier cake. My Sister Bakes started out in a little kitchen in a Melbourne apartment, as Esther began working on ways to use her basket full of freshly picked strawberries. It was then that she made her first Strawberry Crumble Cake, and slowly began exploring different cake recipes. The relatively new store specialises in buttercream (which is a type of icing or filling used inside cakes) cakes that is available in both their classic and signature flavours. Some of their classic flavours include chocolate and red velvet, while their best selling and more popular signature flavours include chocolate salted caramel, matcha, milo dino and earl grey. If you’d like a little taste of these delicious sounding goodies, you can head down to their physical store located near Tai Seng station! You’d definitely be wow-ed by the desserts that they offer. Edith Patisserie bakes some of the most ridiculously beautiful cakes I’ve ever set eyes upon. And this does not encompass only their custom cakes. For starters, their standard cakes are ridiculously well designed, and taste really good!!! They can also customise cakes of any design – from the more floral and rustic looking ones, to even ones with a cartoon design that are best for kids. I’m absolutely in love with their ombre cakes that are topped with either caspier or baby’s breath flowers. 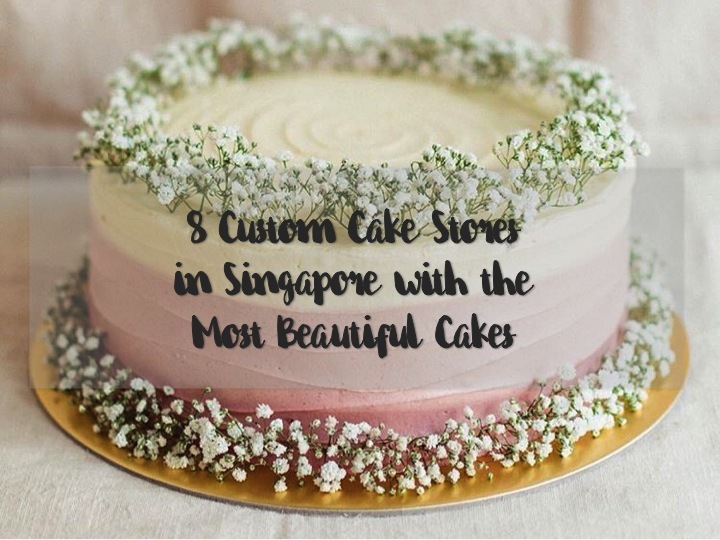 With this list as your guide, you can definitely be assured that any cake you ever wish to customise can be created by all these talented bakers in Singapore! Have we missed out on any of your favourite cakeries? Let us know in the comments!